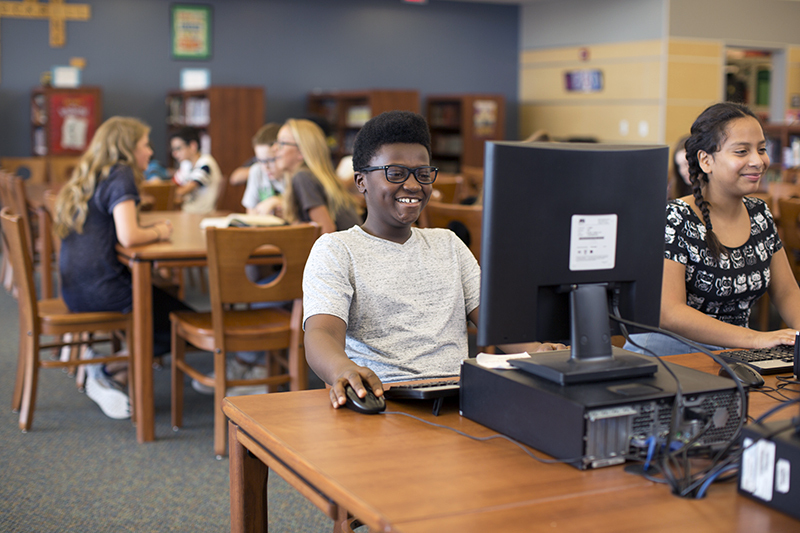 McKinney, Texas – This week, McKinney ISD joins libraries nationwide in celebrating the many ways that libraries serve our communities—and in the case of MISD, our teachers and students. April 8–14 is National Library Week, an annual recognition and celebration of the work of libraries, librarians and library workers. Our libraries aren’t just places to borrow books or study; they’re valued campus resources for our teachers that impact learning throughout our schools. In recent years, the term “library” has given way to “learning commons” in MISD to reflect a shift in philosophy and practice. April 8-14 is National Library Week. Students at Cockrill Middle School in the school’s learning commons. In addition to the traditional shelves filled with books, the learning commons offers an expansive digital literature library that can be accessed by students at any time, and it features a virtual reference library of four to five thousand volumes of established, published reference books along with Discovery Learning reference videos. The MakerSpace concept has gained traction in recent years and is a key feature of the modern MISD learning commons. If the space and the way it is utilized looks different these days, the role of the librarian has changed as well. Today, they’re more aptly titled media resource specialists, and what they provide for our campuses is light-years beyond managing the library inventory. They have at least three years of classroom experience, a master’s degree and TEA certification. And, the faculties of MISD campuses have recognized their contribution by naming a media resource specialist as Campus Teacher of the Year eight times in the past seven years: Tonya Hinkebein (Burks, 2012); Peggy Perret (Eddins, 2012); Christy Hames (Webb, 2012); Wendy Dickerson (Glen Oaks, 2015); Cathy Vance (Press, 2015); Amanda Hamilton (McClure, 2016); Angie Stallbaumer (Bennett, 2017) and Jamie Morris (Dowell, 2018). It’s National Library Week. So, it’s a great time to thank an MISD media resource specialist for the way they support our teachers and serve our students. And, maybe return that overdue book while you’re at it?